Posted by National Admin on 22/11/2018. Andrea Reidel-Carrison is an EA Level 1 General Coach and a Skill-Specific Trainer/Assessor (SSTA) based in Mount Gambier, South Australia. "I started riding at the age of five. We were living in the Morphettville suburb of Adelaide at the time, so my pony was kept at John Hawkes Racing Stables, where I rode him in the round yard, or in the car park opposite the Morphettville racecourse. I attended the Marion Pony Club until my parents purchased a property in Morphettville, so I attended Morphettville Pony Club from then on. Both my parents rode. My father was in the SA Mounted Police Force, my mother a casual rider. My mother’s mother was a great race goer and owned several race horses; I have a treasured photo of me sitting on one of her gallopers when I was age three. My parents were also great friends with Noel Fennell, who owned Willomurra Quarter Horse Stud. After I grew out of my first pony, all my horses for the next several years came from Willomurra and were all first cross quarter horses. During his service on the Police Force, my father had been stationed in Mt.Gambier. He liked the area so much, he decided to retire there. As I was the youngest of four children, and some nine years younger than my closest brother, I was the only child that moved with my parents. By this time, I was 14 years old, and starting to work towards the discipline of eventing. While living in Mt.Gambier, my parents decided that they would like to become race horse owners. This was not a very successful venture for them, but a great one for me, as my two eventers were both my parents failed racehorses. I got both horses to Advanced Level in eventing, now days that would be 3-star. 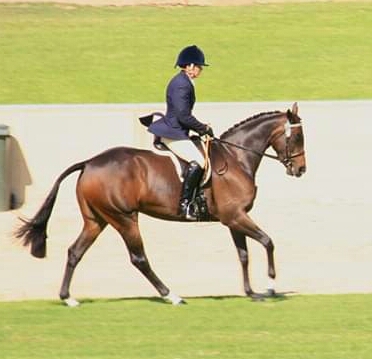 As dressage was part of the eventing discipline, I have always competed in pure dressage, as well as eventing dressage. I purchased from a ‘tried-TB’ sale in Adelaide, what was going to be another event horse, a stunning gelding that I called Beau Cheval. But, as we found out, he had previous soundness issues. Instead, he became my first real show horse. He was very successful, winning at Royals and HOTY. In those days we could compete in both the VIC and SA HOTY shows, and I managed to make the top 10 in VIC, as the youngest ever Hack Rider finalist at 16 years of age. These days I am competing in dressage and showing. I own a lovely Thoroughbred (TB) x Warmblood (WB) mare, that I purchased as a 2-year-old, breaking her in myself. This mare was purchased on the factors of being nice enough to show and moving well enough to be competitive in the dressage arena. 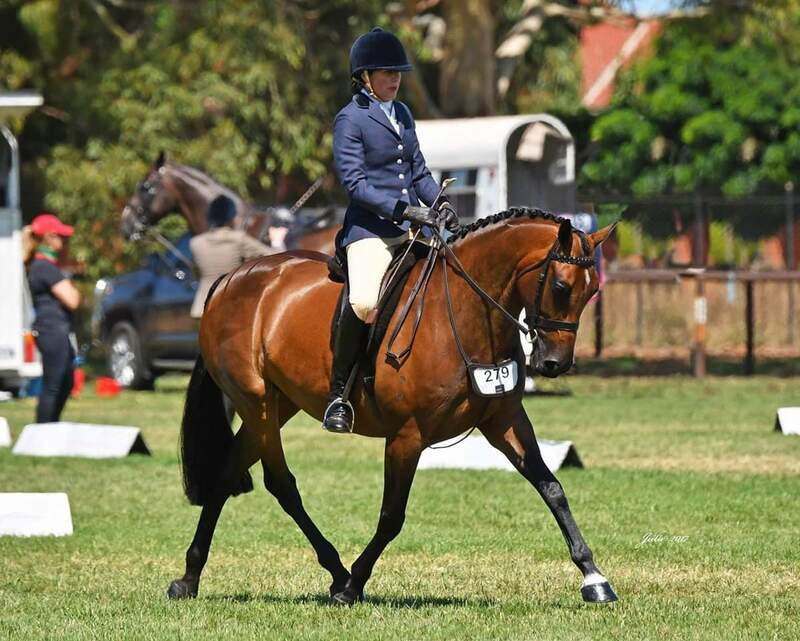 She has indeed been very successful in the dressage arena and did extremely well as a Show Hunter last year too. We are currently the Mt.Gambier Horseland sponsored rider, for the 2017/2018 year. I have always bred from my competition mares, previously using Riding Pony stallions over them, to produce show-quality galloways. After purchasing my current competition mare, I liked the mix of TB x WB so much, that several years ago I purchased a beautiful TB mare. She has produced two stunning geldings by the beautiful WB stallion Contenda. The oldest is rising three, and has just been broken in. I aim to have him as my competition horse in late 2019, as I plan to put my current competition mare in foal this season. Regarding coaching, my parents were very supportive and funded a trip to the UK in my 22nd year. During this time, I qualified as a British Horse Society Intermediate Instructor. At that time in Australia there were no coaching qualifications, so when this was adopted in Australia, I managed to qualify under the EA Coaching Accreditation as well. I was coaching part-time until three years ago, because I was also working as a part-time Veterinary Nurse, qualified in Equine Surgical. These days, I am coaching full-time, seven days a week. If I am not coaching, I am competing, and if I am not coaching or competing, I am judging - as I am also an EA National Show Horse Judge and an EA Dressage Judge. To say I love my job would be a total understatement; to see the absolute joy on the faces of my students, when it all comes together is totally worth it. My successful students have covered all disciplines, from World Cup Show Jump riders, Royal Show and HOTY winning riders, Three Day Event competitors, and EA Dressage combinations. My philosophy is to teach a rider how much they can influence their horse by using their position; to not just sit there and look beautiful, but to understand and feel the difference they can make in the way the horse goes, with empathy and harmony. In the future, I just want to keep living the dream!"